Elevated Express, Street Cars, and Buses at Door. Metropolitan Bus Station in Hotel. The Plymouth Hotel, built in 1912, was one of the oldest buildings in Uptown when it was torn down in 2003 as part of a development project. Preservation groups tried to get the developer to incorporate the building into its plan, as it was structurally sound and, according to Landmarks Illinios, capable of being adaptively reused. Unfortunately the developer felt otherwise. The Plymouth was designed by George Kingsley, best known for his Reebie Warehouse on North Clark. 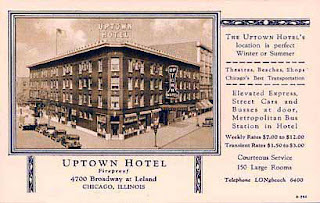 It was the favorite hotel of Essanay's silent film stars. In the lobby of the condo portion, visible from the western side on Racine, is a rather large fragment of the original terra cotta ornamentation. For photos of the Plymouth and its destruction, go to Landmarks Illinois.